I have to admit that Indian cuisine is pretty new to me. I have tried it while out at a few restaurants throughout the years. Some dishes impressed me more than others. One that I enjoyed in particular was Chicken Tikka Masala. I recently started testing some recipes at home for this rich, earthy Indian dish. 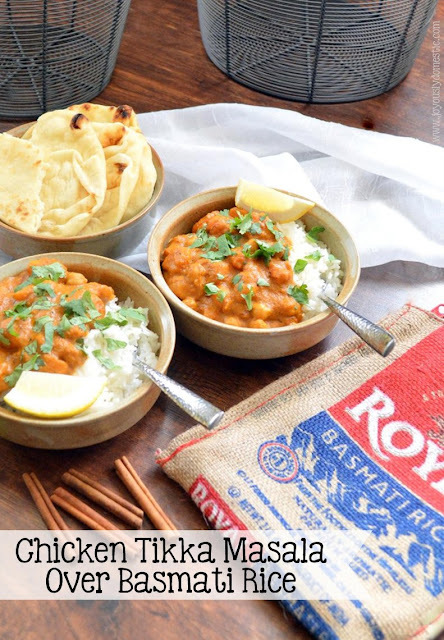 If you're not familiar with it, Chicken Tikka Masala often begins with chicken that is marinated in yogurt and spices, then cooked in a tandoor oven. The chicken is then combined with ingredients like, tomato sauce, garlic, ginger and coconut milk/cream. And, it's usually served with basmati rice. Serving this with naan bread (an Indian flatbread found pretty easily in the bakery section at your supermarket) is almost a requirement. The bread is used to scoop up the chicken and to dip into the sauce as you make your way through this outstanding dish. AUTHOR'S NOTE: I have made several versions of Tikka Masala as I have researched the dish and recipe tested during the development of this recipe. I had success converting this to a vegetarian dish solely using canned, drained chickpeas or with using cubed, roasted butternut squash. So, there is some leeway in the recipe if you'd like to make it a vegetarian one. I have, also, read that cauliflower florets can be a good substitute for meat in this dish. Heat oil over medium heat in a large, heavy pot or Dutch oven. Add chicken. Cook three minutes - stirring occasionally. (No need to brown chicken too much or cook chicken through at this point.) Add onion, garlic and ginger. Stir and cook one minute. Add garam masala, cumin and paprika. Stir while spices become slightly fragrant - about two minutes. Stir in tomato puree and chickpeas (if using). Test a piece of chicken for doneness. Stir in yogurt, cream or coconut milk. Season with salt, if needed. Serve immediately. Serve with basmati rice (cooked per package directions) and naan bread. Garnish with cilantro and lemon. Hi Angela, I actually had a couple questions about one of your older recipes but couldn't get a response on it so decided to see if you'd be able to see my comment on this newer one.